Investigation into Darrien Hunt's death continues; police deny race was a factor. 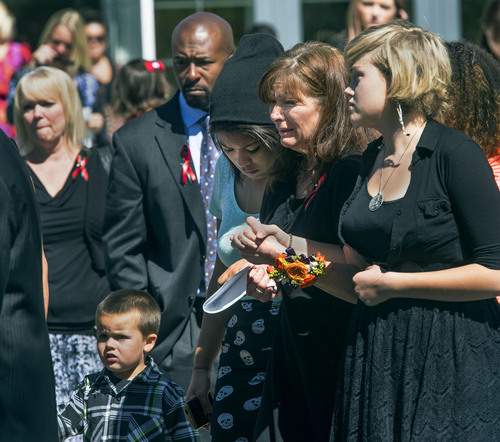 Steve Griffin | The Salt Lake Tribune Family and friends watch as pallbearers carry the casket of Darrien Hunt following funeral services at the Saratoga Springs North Stake Center in Saratoga Springs, Utah Thursday, Sept. 18, 2014. Police officers in Saratoga Springs shot and killed Hunt on Sept. 10, 2014. 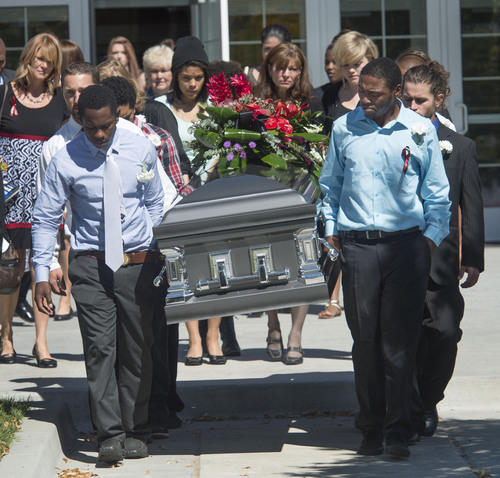 Steve Griffin | The Salt Lake Tribune Family and friends serve as pallbearers as they carry the casket of Darrien Hunt following funeral services at the Saratoga Springs North Stake Center in Saratoga Springs, Utah Thursday, Sept. 18, 2014. Police officers in Saratoga Springs shot and killed Hunt on Sept. 10, 2014. 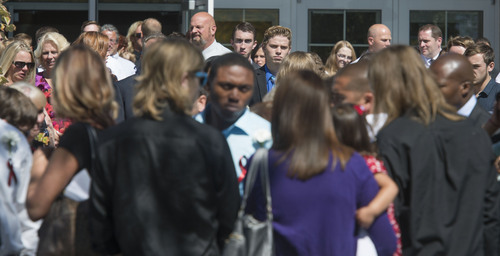 Steve Griffin | The Salt Lake Tribune Family and friends watch as pallbearers carry the casket of Darrien Hunt following funeral services at the Saratoga Springs North Stake Center in Saratoga Springs, Utah Thursday, Sept. 18, 2014. Police officers in Saratoga Springs shot and killed Hunt on Sept. 10, 2014. 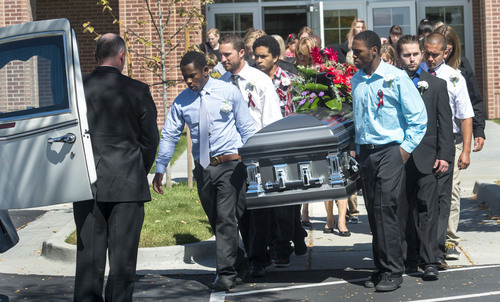 Steve Griffin | The Salt Lake Tribune Family and friends serve as pallbearers as they carry the casket of Darrien Hunt following funeral services at the Saratoga Springs North Stake Center in Saratoga Springs, Utah Thursday, Sept. 18, 2014. Police officers in Saratoga Springs shot and killed Hunt on Sept. 10, 2014. 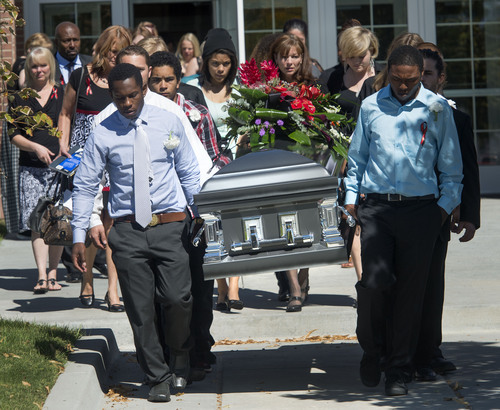 Steve Griffin | The Salt Lake Tribune Family and friends serve as pallbearers as they carry the casket of Darrien Hunt following funeral services at the Saratoga Springs North Stake Center in Saratoga Springs, Utah Thursday, Sept. 18, 2014. Police officers in Saratoga Springs shot and killed Hunt on Sept. 10, 2014. 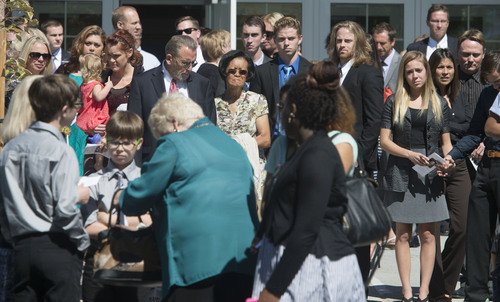 Steve Griffin | The Salt Lake Tribune Susan Hunt is consoled as she follows pallbearers carrying the casket of her son, Darrien Hunt, after funeral services at the Saratoga Springs North Stake Center in Saratoga Springs, Utah Thursday, Sept. 18, 2014. Police officers in Saratoga Springs shot and killed Hunt on Sept. 10, 2014. Saratoga Springs • Darrien Hunt wanted to heal the world. That was just one of the ways that Hunt, who Saratoga Springs police officers shot and killed last week, was remembered Thursday morning at his funeral, held at a church only about 1 1/2 miles from the shopping center where he died. Before all that, he was a man who took after Jesus Christ, his friend Duane Domino said, standing before a congregation of more than 100 friends, family and supporters. "He was kind and he was gentle and loving, and he hurt for the pains of the world," Domino said. "Am I talking about Christ or am I talking about Darrien? If you don&apos;t know, that&apos;s the point." Though Hunt, who was 22, wanted to heal the world, he could not do that on his own, Domino said. But "now, he&apos;s much more capable of carrying out his mission, freed from the restrictions of his mortal body." And somewhere in the world beyond, Domino said he is almost sure there&apos;s music playing. Hunt was a big fan of the rapper Tech N9ne, and brought the music with him to southern Utah on a recent trip with his church. He and a group of older boys in the same Church of Jesus Christ of Latter-day Saints ward traveled to Moab several months ago to raft the rivers, bike for miles and climb Mount Peale. It was while they were hiking up the mountain that Mason Fisher, 16, became friends with Hunt more easily than he&apos;d become friends with anyone. "We were walking through beautiful scenery... [and Hunt remarked] about how extremely lucky we were to be there," Fisher said, adding that he felt such an "extreme feeling of gratitude" from him. Hunt was kind, caring and open, as well as extremely observant. "He would notice things about people that would amaze me," Fisher said. What amazed 16-year-old Noah Patton was how capable Hunt was scaling the mountain. They were hiking when they passed a tall mountainside that Hunt climbed straight up, without ropes, and thrust his arms up victoriously when he reached the top. "He was just so happy," Patton said. Taking on challenges like that was part of who he was. When Hunt&apos;s friend Andrew Scivally lost a member of his Ragnar Relay Race team to an injury just two weeks before the arduous run from Logan to Park City, Scivally approached Hunt about taking his place. Hunt wasn&apos;t a runner, but he said yes, and never complained. When Scivally asked him to sing a song in church with some other men, he didn&apos;t think Hunt would do it. But he did. "He wasn&apos;t scared," Scivally said. When Scivally and Hunt went around the church pulling weeds, Hunt dug deep into the earth with his fingers to get every last weed he could. And not once did he complain when climbing Mount Peale, an almost 13,000-foot peak, even as his knee started hurting on the climb down and he had to limp. "He was trying to do hard things. He was accomplishing hard things," Scivally said. "... Trials can destroy us, or they can make us stronger. Darrien was doing things that made him stronger." He didn&apos;t want to stop, either. He had a strong desire to join the Marine Corps and make his father Curtis Hunt proud. But on Thursday, his father cried standing at a podium behind Hunt&apos;s closed casket, singing "My Soul Hungered." "We love you, Darrien," he said at the song&apos;s conclusion, before hugging Domino and rejoining his family. And Hunt will always be with his loved ones, said his bishop and home teaching companion Rick VanValkenburgh. VanValkenburgh said Hunt is now in the arms of Christ. Hunt is "with you, and he loves you," VanValkenburgh told the mourners. Tamu Smith, a Hunt family friend, was disappointed not to see more people at the funeral. It was "heartbreaking," Smith said, to see the lack of support, especially from city, state and religious officials, including former Saratoga Springs Mayor Mia Love, who is also black and LDS. "As a woman, mother and Christian, I would have thought [Love] might have attended just to mourn with those who mourn," Smith said Thursday. "It seems like she puts politics above human feelings." Love, who is the Republican nominee for Congress in Utah&apos;s 4th District, has declined to comment on the Hunt case. Even the police officers ­ or one of their representatives  could have come to show sympathy, Smith said. "The investigation doesn&apos;t have to be completed for that." Smith, a Mormon in Provo, also would like to have seen some LDS officials from church headquarters or leaders of other faiths be present as a gesture of kindness towards a family that is hurting. "It seems like whenever there is a high profile death, Mormon general authorities show up," she said. "And when there&apos;s a death in the black community, leaders of all kinds of Christian denominations show up. Why not this time?" Hunt was buried at Crescent Cemetery in Sandy. The investigation into his shooting is ongoing. Investigators have said that he lunged at officers with a samurai sword, but the Hunt family attorney Randall Edwards said that he was shot several times in the back. Hunt&apos;s family has questioned whether his race  he&apos;s half black, half white  played into his death. Saratoga Springs police have denied that it did. While Thursday was about Hunt, "tomorrow is all about hope... and believing in the future," Scivally said. "It&apos;s not easy, but that&apos;s how this all works."